30 June 1975: The last operational Douglas C-47 Skytrain transport in service with the United States Air Force, 43-49507, was retired and flown to the National Museum of the United States Air Force at Wright-Patterson Air Force Base, Ohio. A C-47D, it is on display in the World War II Gallery, painted and marked as C-47A-80-DL 43-15213 of the 91st Troop Carrier Squadron, 439th Troop Carrier Group, during World War II. At the time it was withdrawn from service, 43-49507 had flown a total of 20,831 hours. 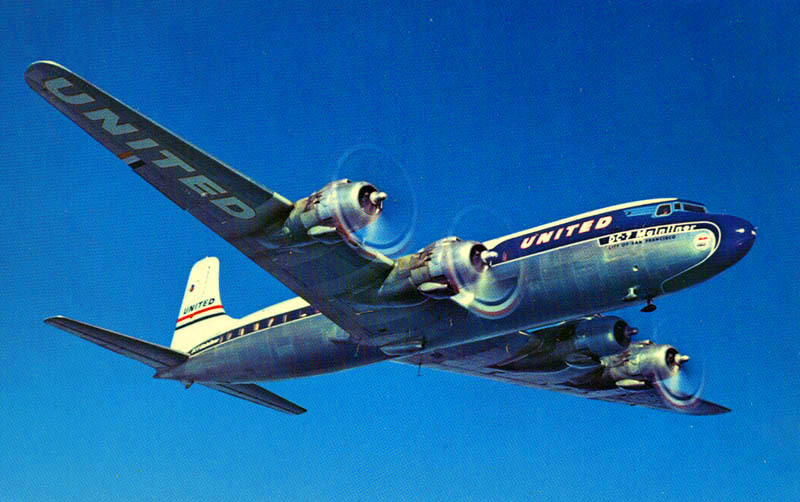 43-49507 (Douglas serial number 26768) was built at Oklahoma City as a C-47B-15-DK Skytrain. 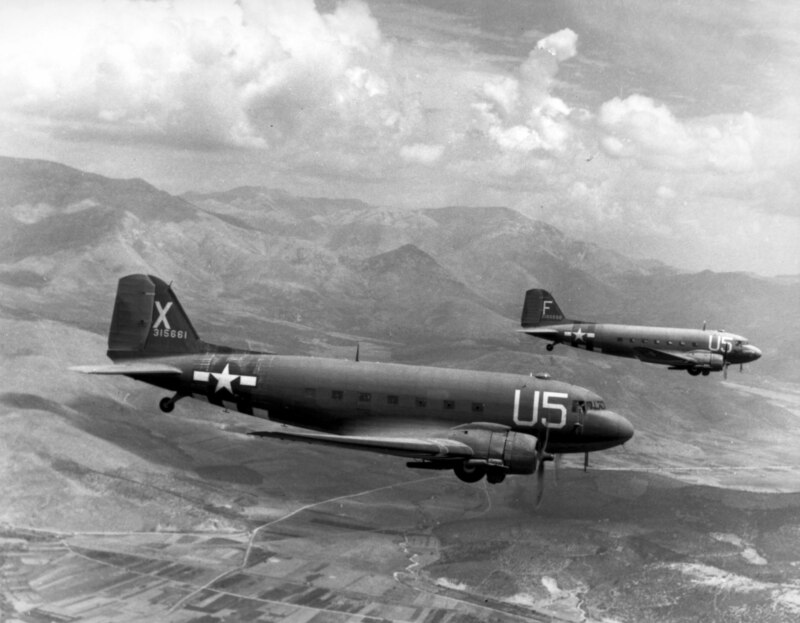 The C-47B differed from the C-47A in that it was powered by Pratt & Whitney Twin Wasp S3C4-G (R-1830-90) engines. These engines were equipped with two-speed superchargers for improved high-altitude performance. Following World War II, the second speed (“high blower”) was either disabled or removed. 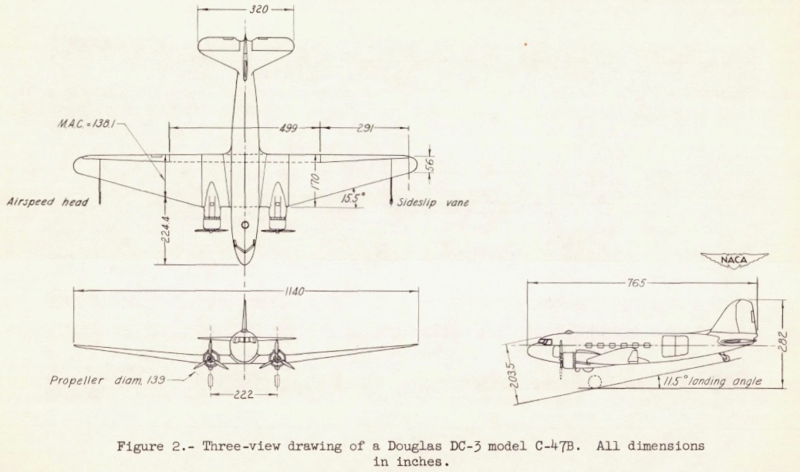 Following this modification, the airplane was redesignated C-47D. The Douglas C-47 Skytrain is a military transport variant of the Douglas Aircraft Company DC-3 commercial airliner. It is an all-metal, twin-engine, low-wing monoplane with retractable landing gear. 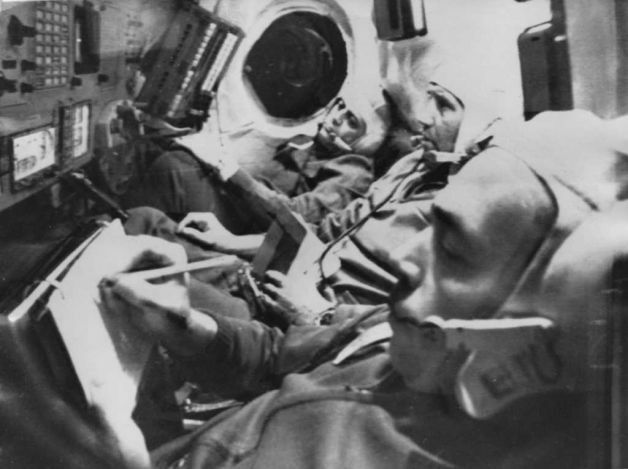 It was operated by a minimum flight crew of two pilots, navigator, radio operator and mechanic/load master. The airplane’s control surfaces are covered with doped-fabric. The primary differences between the civil DC-3 and military C-47 was the addition of a cargo door on the left side of the fuselage, a strengthened cargo floor, a navigator’s astrodome and provisions for glider towing. The DC-3 made its first flight 17 December 1935, while the C-47 flew for the first time six years later, 23 December 1941. The C-47 is 64 feet, 5½ inches (19.647 meters) long with a wingspan of 95 feet (28.956 meters) and height of 17 feet (5.182 meters). The total wing area is 988.9 square feet (91.872 square meters). The angle of incidence is 2°. The wing center section is straight, but outboard of the engine nacelles there is 5º dihedral. The wings’ leading edges are swept aft 15.5°. The trailing edges have no sweep. Empty weight of the C-47D is 17,865 pounds (8,103 kilograms) and the maximum takeoff weight is 33,000 pounds (14,969 kilograms). The C-47A was powered by two 1,829.4-cubic-inch-displacement (29.978 liter) air-cooled, supercharged R-1830-92 (Pratt & Whitney Twin Wasp S1C3-G) two-row 14-cylinder radial engines with a compression ratio of 6.7:1. These were rated at 1,060 horsepower at 2,550 r.pm., up to 7,500 feet (2,286 meters), maximum continuous power, and 1,200 horsepower at 2,700 r.p.m. at Sea Level for takeoff. Each engine drives a three-bladed Hamilton Standard Hydromatic constant-speed full-feathering propeller with a diameter of 11 feet, 6 inches (3.505 meters) through a 16:9 gear reduction. The R-1830-92 is 48.19 inches (1.224 meters) long, 61.67 inches (1.566 meters) in diameter, and weighs 1,465 pounds (665 kilograms). 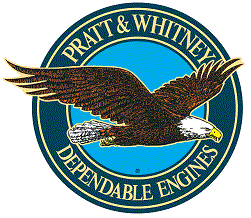 The specifications of the Pratt & Whitney Twin Wasp S3C4-G (R-1830-90) installed on the C-47B and C-47D were nearly the same as the -92 engine of the C-47A. Displacement and compression ratio were identical. The engines’ diameters were the same, though the -90 was very slightly longer than the -92—1.85–2.74 inches (4.699–6.960 centimeters), depending on specific variant. Also, the -90 was heavier than the -92 by 25–30 pounds (11.34–13.61 kilograms), again, depending on the specific variant. The R-1830-90 could maintain 1,000 horsepower at 2,550 r.p.m. at 12,500 feet (3,810 meters), and 1,000 horsepower at 2,700 r.p.m. at 14,000 feet (4,267 meters), a significant increase over the -92. The C-47D has a cruising speed of 161 knots (185 miles per hour/298 kilometers per hour) at 10,000 feet (3,048 meters), and maximum speed of 202 knots (232 miles per hour/374 kilometers per hour) at 3,500 feet (1,067 meters). Its service ceiling was 22,150 feet (6,751 meters). The Skytrain had a maximum range of 1,026 nautical miles (1,181 miles/1,900 kilometers) with full cargo. 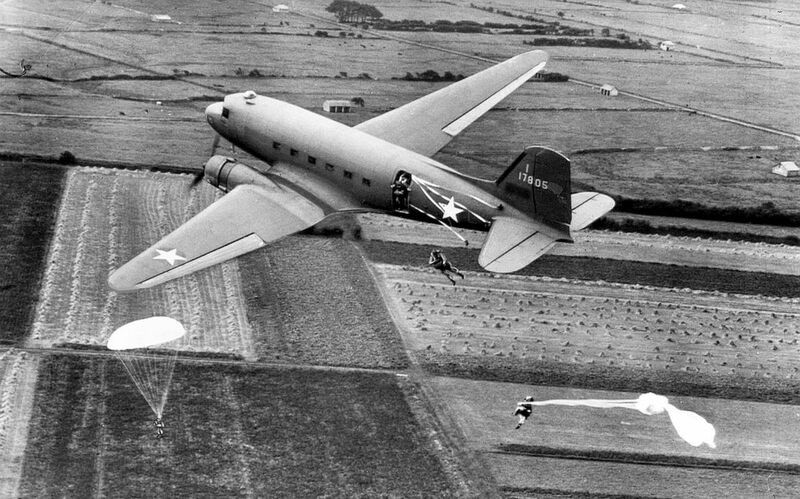 The C-47 could carry 9,485 pounds (4,302 kilograms) of cargo, or 27 fully-equipped paratroopers. Alternatively, 24 patients on stretchers could be carried, along with two attendants. 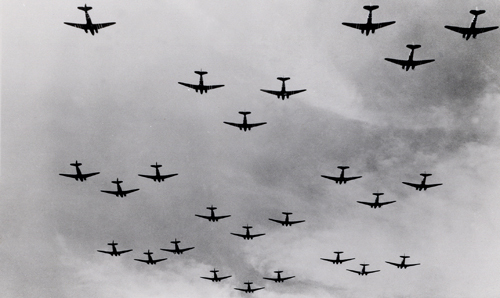 C-47 Skytrains in Vee-of Vees formation. On D-Day, The Sixth of June, 1944, a formation of C-47 Skytrains, nine airplanes abreast, 100 feet (30 meters) from wing tip to wing tip, 1,000 feet (305 meters) in trail, stretching for over 300 miles (483 kilometers), airdropped 13,348 paratroopers of the 82nd and 101st Airborne Divisions, United States Army, and another 7,900 men of the British Army 6th Airborne Division and the 1st Canadian Parachute Battalion, behind the beaches at Normandy, France. 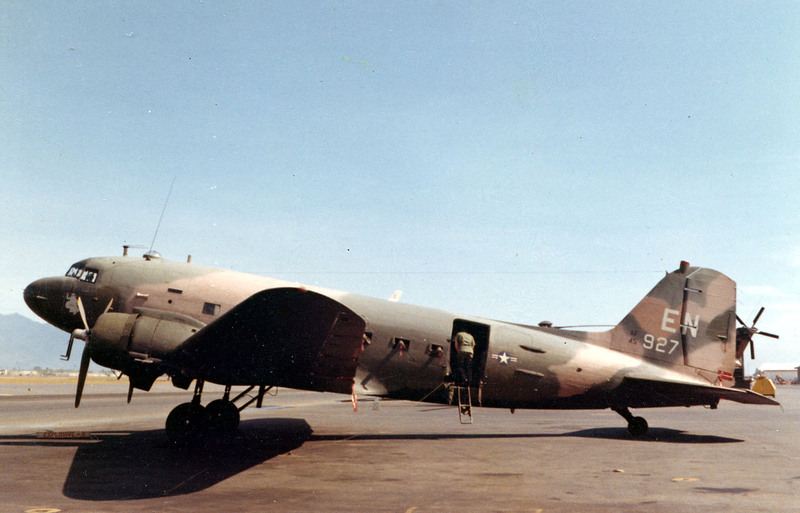 During the Vietnam War, 53 C-47s were converted from their transport role to AC-47 Spooky gunships. These were armed with three fixed, electrically-powered General Electric GAU-2/A .30-caliber (7.62 NATO) Gatling guns firing out the left side of the fuselage. These aircraft were highly effective at providing close air support. The three Miniguns could fire a total of 12,000 rounds per minute. 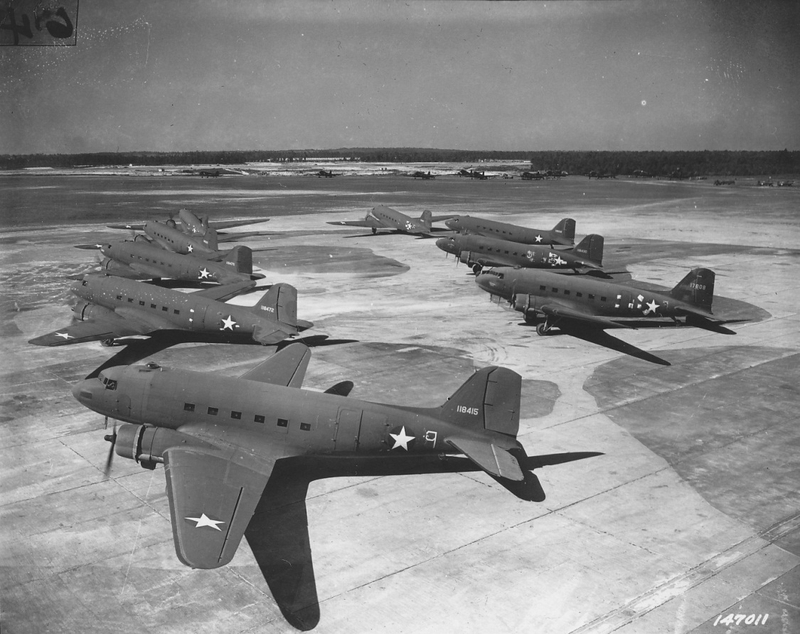 Douglas Aircraft Company built 10,174 C-47 Skytrains at its factories in Santa Monica and Long Beach, California, and at Oklahoma City, Oklahoma. 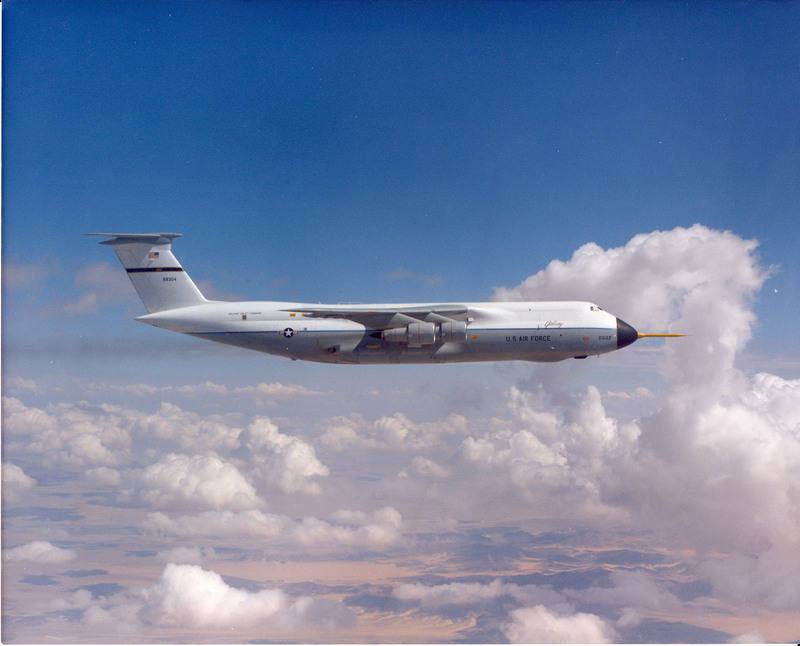 30 June 1968: At 7:47 a.m., Eastern Daylight Time, the first Lockheed C-5A Galaxy transport, serial number 66-8303, took off on its maiden flight at Marietta, Georgia. 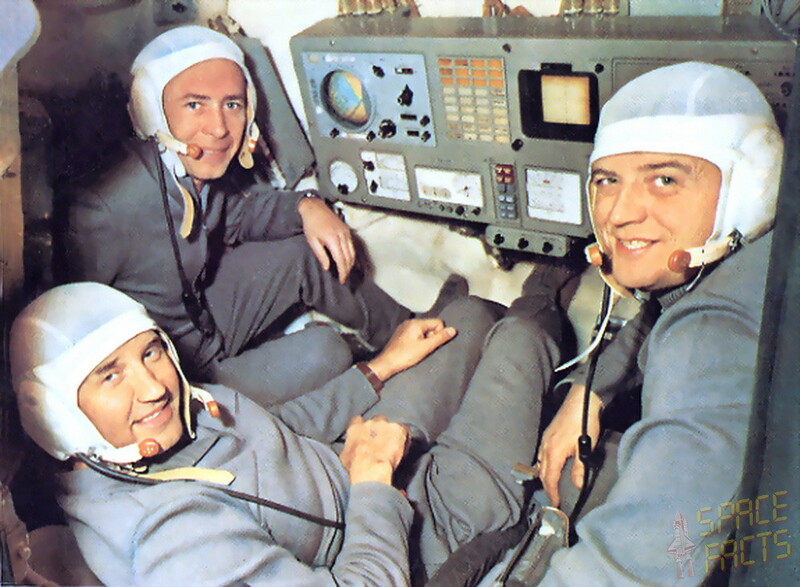 Chief Engineering Test Pilot Leo J. Sullivan and test pilot Walter E. Hensleigh, flight engineer Jerome H. Edwards, and E. Mittendorf, flight test engineer, made up the flight crew. 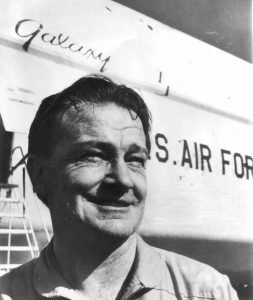 U.S. Air Force test pilot Lieutenant Colonel Joseph S. Schiele was also on board. The C-5A weighed 497,000 pounds (225,435 kilograms) at takeoff. After a 3,800 foot (1,158 meters) takeoff roll, it lifted off at 123 knots (142 miles per hour/228 kilometers per hour). 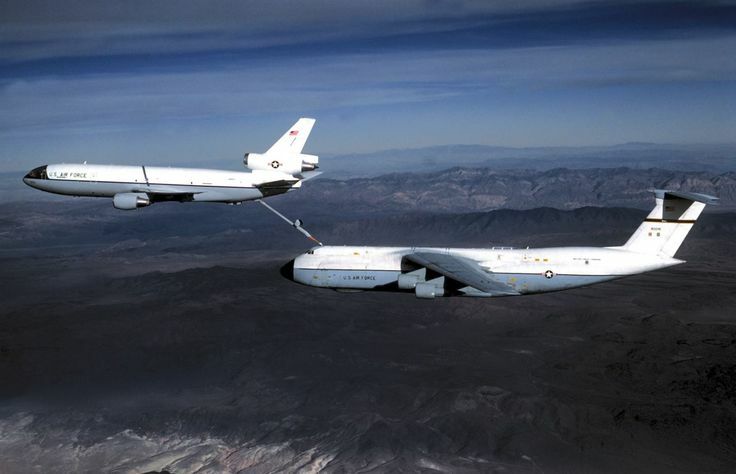 It remained in takeoff configuration while it climbed to 10,000 feet (3,048 meters) at 140 knots (161 miles per hour/259 kilometers per hour). The flight lasted 1 hour, 34 minutes. On landing, the Galaxy’s touchdown speed was 116 knots (133 miles per hour/215 kilometers per hour). The Lockheed C-5A Galaxy (Lockheed Model L-500) is a long-range, heavy lift military transport with high, “shoulder-mounted” wings and a “T-tail.” It has a flight crew of two pilots, two flight engineers and three load masters. The airplane’s cargo compartment can be accessed by a ramp at the rear of the fuselage, and the nose can be raised to allow cargo to be loaded from the front. The wings’ leading edges are swept to 25°. Four turbofan engines are mounted on pylons beneath the wings. The landing gear has 28 wheels in five units, and can “kneel” to bring the cargo deck closer to the ground for loading and unloading. The C-5 is a truly giant aircraft. It is 247 feet, 10 inches (75.540 meters) long with a wingspan of 222 feet, 9 inches (67.894 meters) and overall height of 65 feet, 1 inch (19.837 meters). 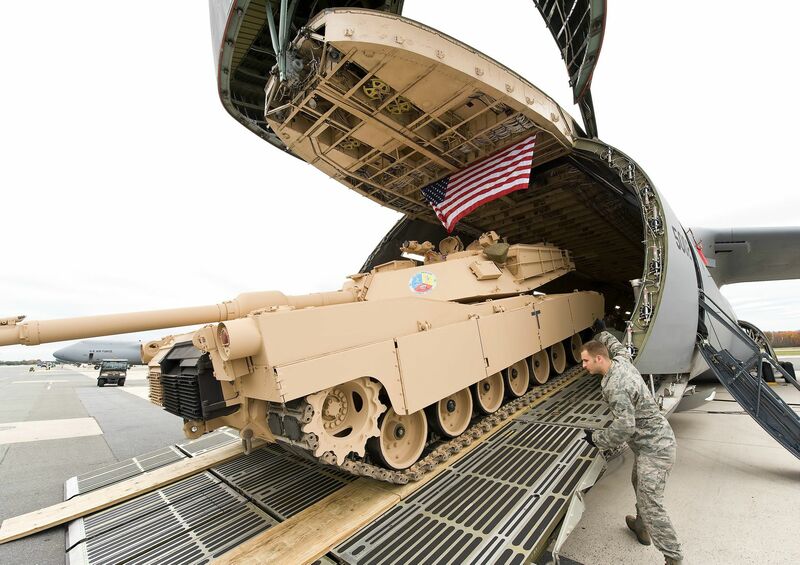 The cargo compartment has a height of 13 feet, 6 inches (4.115 meters) and width of 19 feet (5.791 meters). It is 143 feet, 9 inches (43.825 meters) long. The C-5A has a maximum takeoff weight of 840,000 pounds (381,018 kilograms) and a maximum cargo weight of 270,000 pounds (122,470 kilograms). The C-5A, C-5B and C-5C are powered by four General Electric TF-39 high-bypass turbofan engines, rated at 43,000 pounds of thrust, each. The C-5M uses four General Electric F138 engines rated at 51,250 pounds of thrust, each. The Galaxy has a cruise speed of 0.77 Mach and maximum speed of 0.79 Mach. Its service ceiling is 35,700 feet (10,881 meters) and its unrefueled range is 2,400 nautical miles (3,862 kilometers). 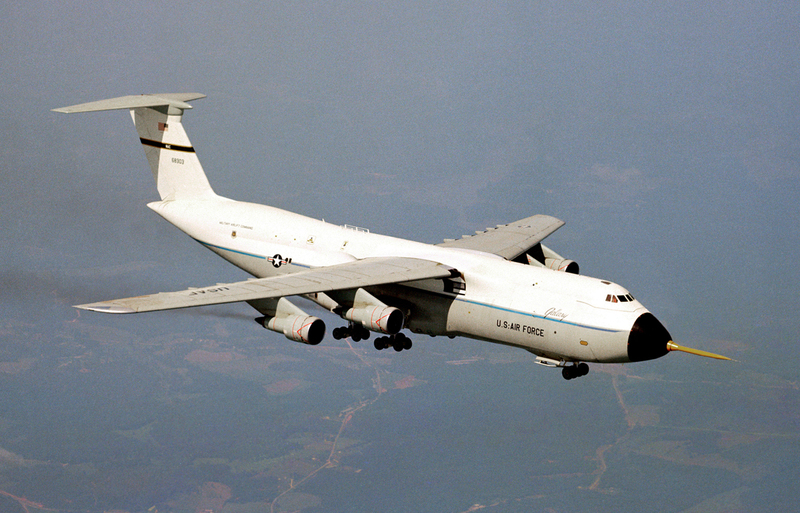 Lockheed produced 81 C-5A Galaxy transports for the U.S. Air Force between 1969 and 1973. These were followed by 50 C-5Bs. Two C-5As were modified to C-5Cs to carry larger “space cargo.” Remaining C-5s in the fleet are being modified to an improved C-5M Super Galaxy variant. The first prototype C-5A, 66-8303, was destroyed by and explosion and fire after being defueled at Dobbins Air Force Base, 17 October 1970. One person was killed. 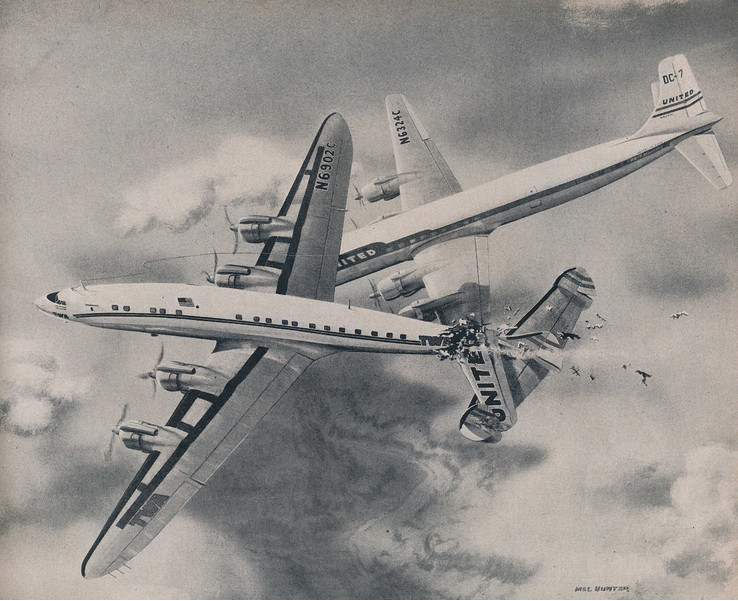 30 June 1956: At approximately 10:32 a.m., two airliners, United Airlines’ Douglas DC-7 serial number 44288, Mainliner Vancouver, Civil Aeronautics Administration registration N6324C, and Trans World Airlines’ Lockheed L-1049-54-80 Super Constellation serial number 4016, Star of the Seine, N6902C, were over the Grand Canyon at 21,000 feet (6,400 meters). Both airliners had departed Los Angeles International Airport shortly after 9:00 a.m. TWA Flight 2 was headed for Kansas City Downtown Airport with 64 passengers and 6 crew members. United Flight 718 was enroute to Chicago Midway Airport with 53 passengers and 5 crew members. The Constellation struck the ground near Temple Butte at an estimated 475 miles per hour (765 kilometers per hour). 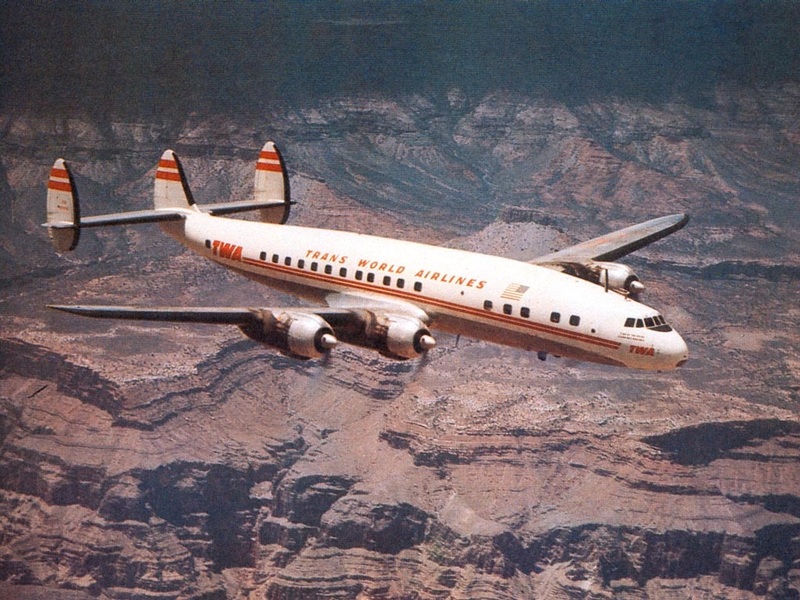 The DC-7’s left wing was so badly damaged that it went into an uncontrolled left spin and crashed at Chuar Butte. All 128 persons on the two airliners were killed. This, as well as other accidents, resulted in significant changes in the United States air traffic control system. Amelia Earhart with her Lockheed Electra 10E Special, NR16020, at Lae, Territory of New Guinea. 30 June 1937. 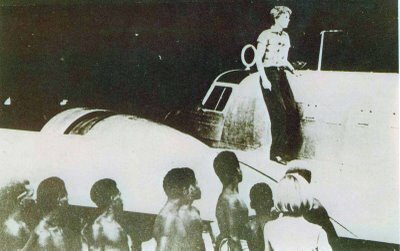 Amelia Earhart and Fred Noonan are delayed at Lae, Territory of New Guinea.